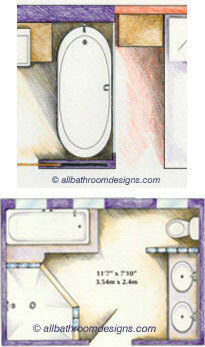 Involving your bathroom designer in the early stages of drawing up plans makes sense if you are designing a new home. Alternatively, a designer's input can open so many exciting design avenues if it's bathroom remodeling ideas that you are looking for. Architects will demarcate the position of the fixtures, windows and doors in your house plans. For some though, the main focus may be solely on solving the restrictions of the internal space and the outer appearance (elevation), as far as window placement is concerned. The interior design often becomes an "after-the-fact" function for when the house is built. WRONG! 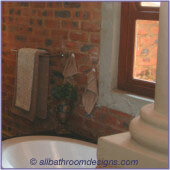 You should plan your bathroom design in as much detail as possible before you start building your home. Where to place fixtures and light fittings to create a focal point and the desired lighting effect and thereafter to plan plumbing and wiring. Where to place windows for practical and aesthetic considerations and what the shape of the windows should be to compliment the bathroom design. Where to place the door to view the best feature of the bathroom when the door is open - perhaps to showcase your designer vanities. What material should be used for a dividing wall to either create a feature wall or to allow for maximum natural light to enter the bathroom. How to make allowance for maximum storage space in the bathroom. What structural reinforcing should be considered for a big whirlpool tub or concrete installation. The above are the immovable elements (or unnecessarily costly to move at a later time) and should form part of your initial bathroom floor plans. So, get your interior designer and architect together to ensure everyone is on the same page. A specialist bathroom designer understands the peculiarities involved in bathrooms: building codes, permits required and the costs involved with remodeling bathrooms. The money spent on consulting with a designer could save you a lot in avoiding costly mistakes. 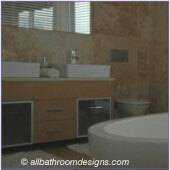 Have a look at the cost of remodeling a bathroom using a designer, to get an idea of fees charged. PLUS, these professionals have a wealth of experience and could come up with s many exciting (and perhaps cost-saving) ideas which you may not have considered. They also make it their business to stay informed on the latest bathroom gadgets, environmentally friendly systems, styles, techniques, suppliers, using novel materials for a modern bathroom design ...and more. Consulting with a designer does not mean you can't DIY. Discuss with your designer exactly what service you require from her (or him!). You could pay a per hour consulting fee only - or extend it to include a design drawing and mood board with suggested bathroom colors, material swatches and tile samples - and guided by that, you'll complete the project. So, What do You Need from Your Designer? You may think: "I don't feel confident enough to do my own design, but I know more-or-less what I like". You then choose a designer by referral and/or by viewing her portfolio. You'll brief her (or be guided by her) on your chosen style and budget ...and then you trust her to create your dream bathroom. 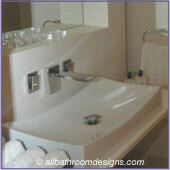 You have very clear ideas about what you like and you've created a flip file with your favorite bathroom designs. Make notes about what you absolutely dislike too! Be open to suggestions though - which does not mean conforming to a designer's trademark style. Then brief your designer and interact with her often during construction. You want to do this yourself (essentially) but you need guidance on how to draw all the elements together: proportions, complementary color scheme, where to place accent tiles etc. Your designer may be prepared to do this on a consultancy basis for an hourly fee. You will need to do all the legwork i.e. 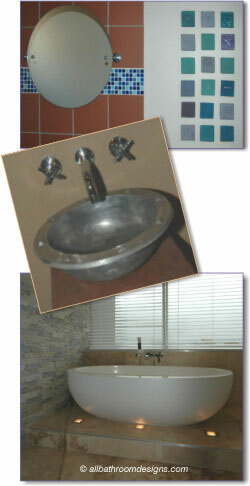 sourcing materials, but that can be enormous fun and infinitely rewarding. You don't need an interior designer at all. You have a flair for coordinating elements and an instinctive understanding of what constitutes good design. (And of course, you've picked up so many great bathroom design ideas from our pages, you can't wait to get started!) Trust your instincts. However, do take the trouble to do the paint swatches, drawings, tile planning etc. ...and create a beautiful bathroom. The Bottom Line: You need to choose a designer who will work with you - at whatever level of involvement you need their expertise. Refer to our Bathroom Remodeling Costs checklist to assist you with planning the budget for your project. 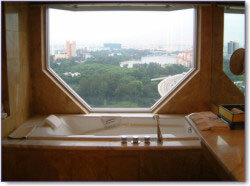 Talk to your prospective bathroom designer, look at his/her body of work and if possible, talk to previous clients. Does he/she seem to understand your vision and style, can he/she work within your budget and do you have a rapport with him/her - then go for it.